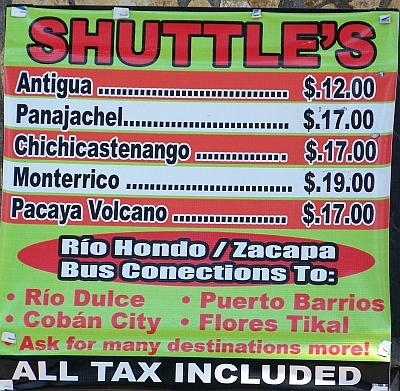 Time for another up-to-date rundown on prices for travelers, this time for Honduras. I was only there for a week and spent a fair bit of that in swanky hotels on assignment and moving around with a driver, so no info here on the price for a chicken bus from Tegucigalpa to San Pedro Sula. I’ve been preaching the benefits of traveling to Latin America ever since the dollar started dropping a few years ago and I felt so strongly about the wisdom of going to this region that I co-wrote Traveler’s Tool Kit: Mexico and Central America. If you’re still on the fence about heading to Central America, I’ve got three words for you: cheap, cheap, cheap. 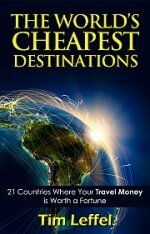 That’s Honduras when it comes to prices for travelers. Exhibit A is the first photo here, which could easily be the prices in dollars at a café in Paris, London, or Oslo these days. 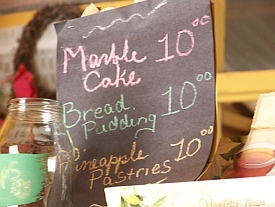 Instead it shows pastry prices in lempiras at a gringo-owned traveler café in Copan Ruinas town. How many lempiras to the dollar? 19. Yes, 19, making these freshly baked goodies all of 53 cents. Exhibit B was going to be from the same town, a photo of the room service menu at Hotel Marina Copan. But it wasn’t readable when I shrunk it down. So I’ll just tell you that at 19 to the dollar, the most expensive breakfast on the menu is the “Famous American” at less than six bucks. (I’m not sure what a “famous American” breakfast would be, but I assume it’s fattening.) A mixed omelette is a shade over $4. I had a comida corrida lunch at the local market. Fried chicken, vegetable soup, rice beans, potato salad, tortillas, and a soda-it was 44 lempiras, or $2.30. I gave the cook’s daughter 50 lempiras and told her to keep the change. Big spender I am. At these prices, it hardly makes sense to stay home! Great post. I got back from Honduras a few months ago and spent a whole $12 on a centrally-located room in Tegucigalpa with a private bath+hot water. Even in Roatan, where the gringo chow is a little pricey, I found a breakfast of a baleada (a thick tortilla stuffed with beans & cheese) in a restaurant for 50 lemps (about $2.60). And they were being sold from a van off the street in West End for about half that. The best part, though, was when I had Copan Ruins to myself one morning, unless you want to count the ground crew blowing leaves off the steps. Did you pick up any coffee in Copan? I scored organic coffee beans from a women’s coop at $4.50 per pound. It was for sale in a German-run shop in town. We are currently in Utila Honduras, making our way to Nicaragua (albeit slowly!). Those sand flies/no-see-ums are a weird thing: a woman who was lying beside me on the beach got bites all over her ankles and I didn’t get one in four days’ time. I wore a little DEET, but that was all. Some people just attract them it seems. As for the heat, I drank that in like a parched man in the desert. To each his own I guess. Christine – Budget wise, my guess is one month in Western Europe will equal four months in the latter if you avoid the Cancun/Los Cabos type places. Plus you’ll be in hotels with private rooms, not in dorm beds in a hostel. Have a blast!